The bravura monument which is an iconic symbol of Hyderabad city, Charminar, was built by Quli Qutab Shahi in 15th century. This monument bags the prestigious title of “The Arc de Triomphe of East”. 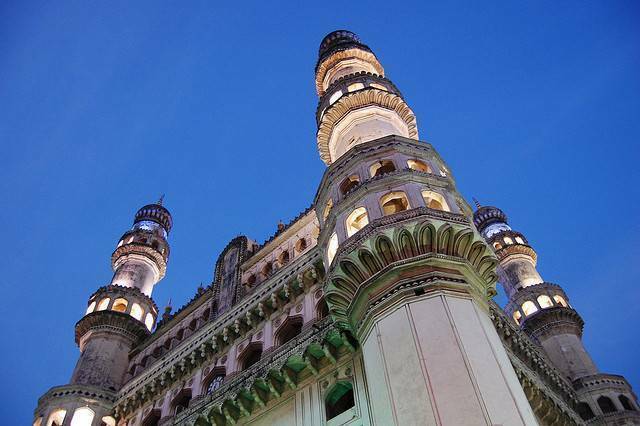 Dating back to 400 years, Charminar derived its named from its four magnificent minarets. Each of these minarets has the height of 48.7 m above base level. The architectural style of Charminar is mixture of Islamic and Cazia style. Possessing the intricately carved out floral motifs are the feast for our eyes. The entire monument is built using lime mortar and granite. The illuminated Charminar in night times mesmerizes the viewers. One can get the Panoramic view of Golconda Fort from Charminar. Lying amidst of the Lad Bazaar Stalls which has glittering traditional bangles add more to the beauty of Charminar, the important attraction of Hyderabad.